May I be the person You want me to be, and may Your will be done in my life today. When the “kiss of peace” was moved beyond the altar rails of churches and out into the nave and renamed “the sign of peace,” mass goers could finally experience the sense of touch in the celebration of the eucharist. And what a difference it has made. At first in the mid-1960s, the sign or the passing of the peace was thought by many to be silly and over-sentimental. In time, though, it has become for a lot of us as important in some ways as receiving communion. There are those who value community as much as communion and see them as two sides of the same coin. The clasped hands at the Our Father, greeting our neighbors in the pews with the pax Christi, followed then by having the host and chalice offered us – often enough by lay communion ministers who are our friends – together put the seal of authenticity upon our sense of community. The sense of sight is satisfied by the architecture of our churches and the celebrant’s vestments, the sense of sound in the voices raised in response and song. The Latin word for “wisdom” is sapienta from sapere, to taste. While the host is bland to the tongue, the warmth and pleasing taste of the wine warms our inner selves. The incense is the aroma of corporate oration. As we see the smoke rise from the thurible, we can imagine the co-mingling of our individual aspiration and hopes. All five senses are acknowledged and employed in the vigil, Sunday and major holy day masses at Our Mother of Perpetual Help. They combine to engage us in a holistic way that together with the lections and thoughtful and pastoral homilies bind us together as one. A situation for which to be grateful. For the wisdom to receive the stories and experiences of those different from ourselves and to respond with respect, let us pray to the Lord. For the strength to teach our children how to resolve differences non-violently and respectfully, and the courage to model it in our own behavior, let us pray to the Lord. For our faith community, that we may celebrate and welcome the diverse faces of Christ in our worship, our ministries, and our leaders, let us pray to the Lord. For our faith community, that we may respond boldly to the Holy Spirit's call to act together to end violence and racism, let us pray to the Lord. For the protection of all police and first responders who risk their lives daily to ensure our safety; for fair and just policing that will promote peace and well-being in all our neighborhoods, let us pray to the Lord. For our public officials, that they will strive to work for fair education, adequate housing, and equal opportunities for employment for all, let us pray to the Lord. For our parish, that we may cultivate welcome, extend hospitality, and encourage the participation of people of all cultures, ethnicities and backgrounds, let us pray to the Lord. Surrounded by violence and cries for justice, we hear your voice telling us what is required . . .
“Only to do justice and to love goodness, and to walk humbly with your God” (Mi 6:8). Strip away pride, suspicion, and racism so that we may seek peace and justice in our communities. Flood our path with your light as we walk humbly toward a future filled with encounter and unity. Monday morning came, and there was Kyle with the huge stack of books again. I stopped him and said, “Damn boy, you are gonna really build some serious muscles with this pile of books everyday!” He just laughed and handed me half the books. Over the next four years, Kyle and I became best friends. When we were seniors, began to think about college. Kyle decided on Georgetown, and I was going to Duke. I knew that we would always be friends, that the smiles would never be a problem. He was going to be a doctor, and I was going for business on a football scholarship. Kyle was valedictorian of our class. With one small gesture you can change a person’s life. For better or for worse. God puts us all in each other’s lives to impact one another in some way. Look for God in others. There are moments in life-both spiritual and intellectual—that are like no other. They change us. They redirect us. They complete us. Between these moments of Enlightenment—all of which are relatively rare—we simply go from one life event, one change point, to another. But after such times of acute insight, life takes on a different hue. witness of Christian values with trust and hope. Glory be to you forever. Amen. Gracious God, we place before you our sisters and brothers in Iraq. They are numbed and almost immobilized by the horrendous violence they have experienced. We can hardly imagine the intense sadness and grief, the confusion and anger that dominate their own thoughts and prayers this day. We know that it is you who can turn minds to thoughts of peace. Your Spirit can change hearts. Even enemies begin to speak to one another and nations seek the way of peace together. when hatred is quenched by mercy, and vengeance give way to forgiveness. For this we never cease to thank you, for the presence and action of that Spirit in the world. We simply place our family in Iraq in your tender and loving care. We pray this in the name of our brother Jesus. 1. The first reassurance we have comes from the fact that Jesus prayed so much for the unity of the disciples. This is the prayer of the Last Supper, Jesus asks: “Father, that they may all be one”. He prayed for unity, and He actually did so as the Passion was imminent, when He was about to offer His very life for us. That is what we are continually called to reread and meditate on, in one of the most intense and moving passages in Chapter 17 of the Gospel according to John (cf. vv. 11, 21-23). It is so beautiful to know that the Lord, shortly before dying, was not concerned about himself, but was thinking about us! And in his heartfelt dialogue with the Father, He prayed precisely that we might be one with Him and with each other. It is with these words that Jesus made himself our intercessor with the Father, so that we too may enter into full communion of love with Him; at the same time, he entrusts us with his spiritual testimony, so that unity may become ever more the distinctive mark of our Christian communities and the most beautiful response to whomsoever asks us to account for the hope that is in us (cf. 1 Pt 3:15). Once, in another diocese I had before, I heard an interesting and kind comment. It was about an older woman who had worked all her life in the parish, and a person who knew her well said: “This woman never criticized, she never gossiped, she always wore a smile”. A woman like this could be canonized tomorrow! This is a good example. And if we look at the history of the Church, there are so many divisions among us Christians. Even now we are divided. Also in history, we Christians have made war among ourselves for theological differences. Let us think of the 30 Years' War. But, this is not Christian. We must also work for the unity of all Christians, to take the path of unity which is what Jesus wanted and prayed for. 3. In the face of all of this, we must make a serious examination of conscience. In a Christian community, division is one of the gravest sins, because it makes it a sign not of God's work, but of the devil's work, who is by definition the one who separates, who destroys relationships, who insinuates prejudice.... Division in a Christian community, whether in a school, a parish, or an association, it is a very grave sin, because it is the work of the Devil. God, instead wants us to develop the capacity to welcome, to forgive and to love each other, to be ever more like Him, who is communion and love. The Church's holiness consists in this: in recognizing herself in God's image, showered with his mercy and his grace. Dear friends, let these words of Jesus resound in our hearts: “Blessed are the peacemakers, for they shall be called sons of God” (Mt 5:9). Let us ask sincerely for forgiveness for all the times in which we have caused division or misunderstanding within our communities, knowing well that communion is not achieved except through constant conversion. What is conversion? It is asking the Lord for the grace not to speak ill, not to criticize, not to gossip, to love everyone. It is a grace which the Lord gives us. This is what it means to convert the heart. And let us ask that the daily fabric of our relationships may become an ever more beautiful and joyous reflection of the relationship between Jesus and the Father. 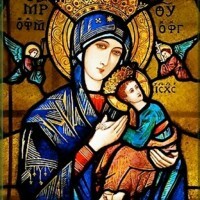 Mother of Perpetual Help, today we face so many difficulties. You remind us to reach out and help those in need. Help us understand that our lives belong to others as much as they belong to us. Gratitude is not only the posture of praise but it is also the basic element of real belief in God. When we bow our heads in gratitude, we acknowledge that the works of God are good. We recognize that we cannot, of ourselves, save ourselves. We proclaim that our existence and all its goods come not from our own devices but are part of the works of God. Gratitude is the alleluia to existence, the praise that thunders through the universe as tribute to the ongoing presence of God with us even now. 'That doesn't have anything to do with it,' he replied. Happiness is something you decide on ahead of time. Whether I like my room or not doesn't depend on how the furniture is arranged .. it's how I arrange my mind. I already decided to love it. Old age is like a bank account. You withdraw from what you've put in. So, my advice to you would be to deposit a lot of happiness in the bank account of memories! Thank you for your part in filling my Memory Bank. I am still depositing.